Welcome to another issue of Breathe Magazine, our final edition for 2017. When launching our magazine, our team shared the goal of inspiring women to slow down, make time for themselves, and simply ‘breathe’. Mindfulness and self-care are no longer considered selfish indulgences but necessities, and an integral part of the quest for body and soul revival. This message has been so well received and has allowed us to grow and bloom with you, our wonderful Breathe community. From those who’ve been with us from our launch issue to new readers who have just discovered our magazine, 2017 has been both rewarding and humbling, and we have you to thank for it. 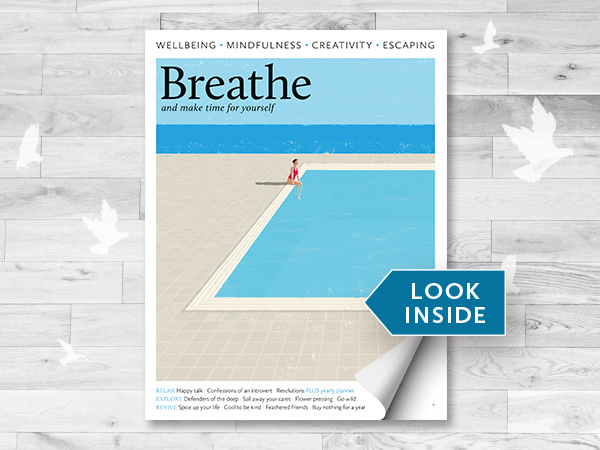 In Issue 6 of Breathe, find a resolution you can stick to with our handy pull out resolution planner that will set out your journey and help keep you on track not just for the year, but for life. Find out how you can achieve ‘mindfulness on the go’ by incorporating practice and activity prompts into your day so that mindfulness can be your companion anywhere and at any time. The world is more connected than ever with social media and digital chatter in constant flow. Yet, many of us are allowing our social skills to erode, particularly our younger generation who are most affected; many finding face-to-face conversations uncomfortable and unnatural. Reignite the spark of human interaction by reading the art of conversation. Dive into our feature on overcoming creative block with suggestions to spark your imagination like going for a stroll or listening to upbeat music, plus exercises to get your creative juices flowing once more. Uncover what being an introvert is truly like, their prevalent traits, and why solitude and silence are not just a choice for introverts but a necessity. With summer’s arrival, the heat is well and truly on. In this issue, be inspired to refresh and indulge your palate with our delicious fruit-filled icy treats, yoghurt pops, satisfying granita, and chilled, summer-friendly beverages. All this and much more in Issue 6 of Breathe Magazine Australia, on sale now.